It was such a gorgeous day yesterday, that I could not stay inside. 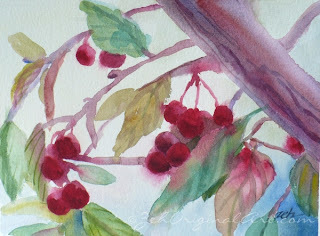 All plans for whatever I was GOING to paint went out the window as I headed out the door with paintbrush, palette and watercolor paper to paint in the garden. 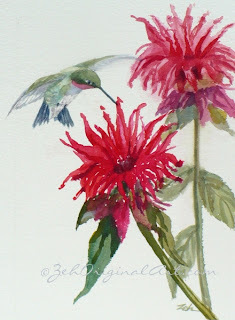 The first painting I did yesterday was of the red bee balm blooming by the side of the house. I did not see the hummingbird fly to the flowers, but I heard him buzz by my head. So he was most likely waiting for me to finish the painting and be gone. That's what I did. The second painting I did was totally unexpected. I'd set up my stuff underneath the crabapple tree and meant to paint the hydrangea flowers blooming in front of me. However, I had not brought out the umbrella, so there were dappled sunlight and shadows on my paper meaning it would be difficult to see what I was doing. Rather than fight it, I just went with it and painted the shadows on my paper. This is what resulted. Lots of fun, and what a great day! Love the hummingbird with the red bee balm. Thank you! It was fun to paint.